My Love Story contains episodes 1-24. Takeo Goda's hulking physique and affinity for sports make him popular with other guys, but girls just find him intimidating. Unaware of his gentle nature, the girls that Takeo likes always seem to fall for his handsome best friend, Suna, instead. 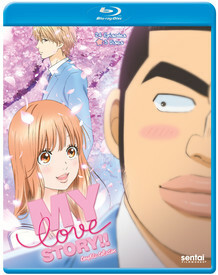 Takeo is resigned to being Suna's wingman, with no hard feelings between them, until Takeo rescues Rinko Yamato from a molester on the train. Unfortunately, while Rinko might see past Takeo's brutish appearance, Takeo's become so conditioned to girls preferring Suna that he assumes Rinko is the same! Being the good, genuine guy he is, he's going to do everything he can to help the two of them be happy. Will Takeo let himself believe someone likes him? Love isn't blind: it's just a little dense in MY LOVE STORY!! Special Features: Clean Opening and Closing Animations.